Scotty from Motiva came over to Car Crafters yesterday and told us what was up. Basically the way we wired the car last time was crap and the stock ECU is very good at "overlooking" wiring flaws, and letting the car run anyway. So the main issue we are having is with the MAP sensor getting a constant 5v reading. Stock ECU plugged into harness, MAP gets 5v. AEM powered directly from 12v source and good ground, MAP gets 5v. AEM plugged into harness, MAP gets .44v. Wiggle the harness and the voltage changes, find grounds, ground them, MAP voltage gets up to a fluctuating max of 1.75v. You can clearly see the ordeal we are in for, laid out before you in the below picture. 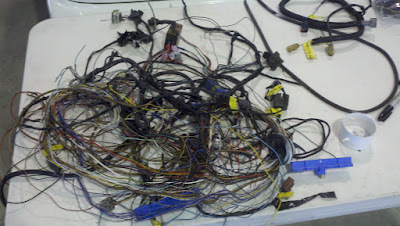 We took of to the junkyard yesterday and sourced a harness out of a 92 maxima (same ECU plug) to try and re pin the ECU. This looks like a week long undertaking and we only have a few days to get it done, yet again.